Make the most of fresh summer tomatoes with these simple, delicious sandwiches. Top lightly toasted bread with creamy ricotta cheese and a sprinkle of salt and pepper. Juicy heirloom tomatoes are showcased to their full potential with just a drizzle of garlic and basil-infused olive oil. Serve the open-faced sandwiches as an easy appetizer, tasty lunch or light dinner served with a side salad. These kind of sandwiches are best eaten out of doors, so you can also, prep the different components ahead of time and assemble later on as a perfect picnic food. Enjoy these delicious sandwiches for lunch or appetizer. Make the infused oil ahead of time and drizzle it over everything! Find Chinese red chiles in Asian grocery stores online. You can also substitute two dried chiles de arbol if you have trouble finding them. Per Serving: 618 calories; 59g fat; 15.1g carbohydrates; 9g protein; 18mg cholesterol; 163mg sodium. This infused oil is a superstar! Warning: do not use the entire cup of oil on your sandwiches! You will definitely have leftover oil, and that's a good thing. I love the little kick you get from the oil over the tomatoes and cheese. I used a coarse country-style loaf for the bread to hold up against the weight of the cheese and tomato. 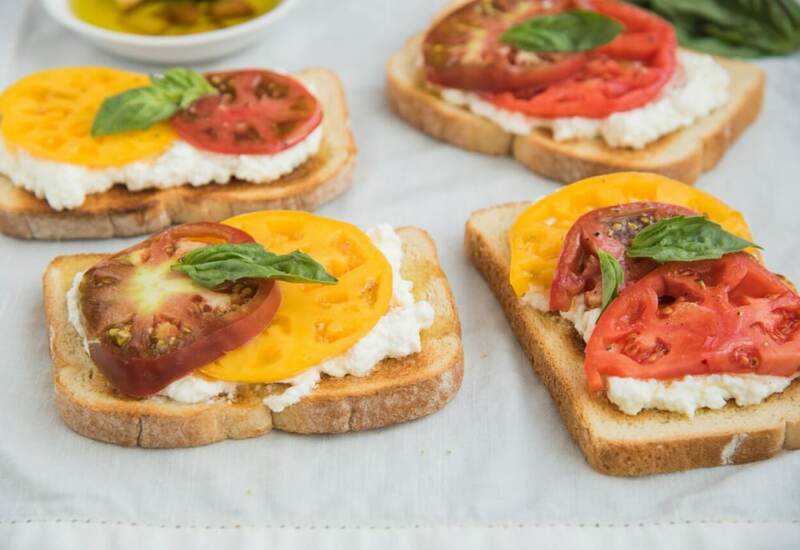 These ricotta and tomato sandwiches are great for lunch! I get so tired of eating out when I'm at the office, so this was a nice change from what I normally do. Also, can we talk about how amazing the oil is! Love it!